I have found heaven. And its name is BonBliss. 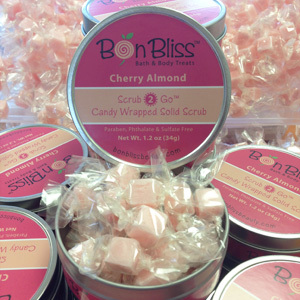 Comprised of husband and wife team Elissa and Jay Choi, BonBliss makes deliciously scented hand and body scrubs. I have sampled each of the 14 scents, and I can honestly endorse every one of them. BonBliss scrubs are single-use treats perfect for traveling or a quick sweet indulgence wherever you are. BonBliss treats come in the form of Moisturizing Body Truffles, perfect for the shower, and Scrub-2-Go minis, ideal for a moisturizing boost after washing your hands. 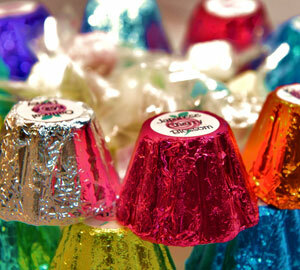 Each is individually wrapped and resembles an edible delight. And you know how skincare companies often write “Do Not Eat” on their packages, and you sarcastically think, “Really? I never would have guessed.” Well, BonBliss really did need to warn users because their products are so ridiculously alluring that you’ll truly want to eat them. But don’t. Instead, add a little water to one and gently crush it and rub it onto your skin. It will leave a yummy scent and a light moisturizing gleam. And get this: If you shower with a truffle in the morning, you will still be able to smell it at night. As a body scrub connoisseur, I can assure you that most scrubs do not last until bedtime. BonBliss products are free of parabens, phthalates, and sulfates. Choosing your favorite scent might prove difficult, but mine is the Cherry Almond. I simply cannot get enough of this one. First runner up? Sweet Satsuma. Each 1-ounce body truffle is $3.75, and a tin can of bite-size scrubs are $10.95, but they occasionally run specials. Visit them at BonBlissBeauty.com. You can also follow them on Facebook. As BonBliss states, be careful when using the truffles in the shower because they will leave a light film that can make the floor slippery. Even though they are intended as single-use scrubs, if you are willing to forego a little indulgence, the moisturizing body truffles can last for two uses.